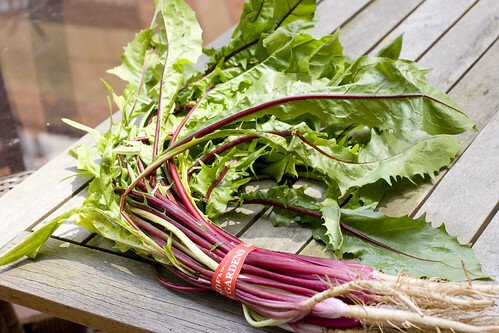 Red Dandelion Greens look really cool, don’t they? They have bright hot pink, almost red, stems with bright green leaves. I throw them into salads for extra color, but they are a bit tougher than your standard greens, so I like to mix them in with some tender leaves. They are a little bitter but not quite as strong as endive. 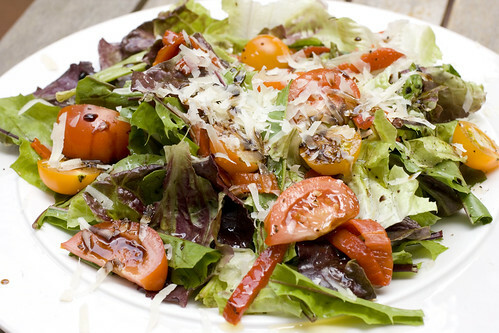 For lunch, I piled together some red dandelion greens with red romaine, some yellow cherry tomatoes and red heirloom tomatoes, some roasted peppers, and a shower of Pecorino Fresco. I drizzled some of my favorite balsamic and a very fruity olive oil. It was a simple piece of heaven. posted by jessica	at 03:45 PM	Filed under Basics. You can follow any responses to this entry through the RSS 2.0 feed. Both comments and pings are currently closed. I can’t really eat this raw. I usually sautee it with olive oil and garlic. Same as Kim here, although I’ve only ever had it sauteed. I should give it a try raw although I’ll probably cut up peaches for it. Oh I love the addition of the pecorino fresco! That just made the dish. I would like to try these greens though I have yet to try them raw. that shaved cheese is key. lovely colors! For the first time I used the red dandelion in a salad. I chopped it fine and mixed it with romaine lettuce , olive oil 2 teaspoon of vinegar ,crushed 2 cloves of garlic,little bit of sea salt ,one stalk of celery, fresh ground black pepper, and some feta cheese on top. Not only that it was delicious, my son’s swollen feet were back to normal this morning, he said that he is going to try to eat that salad every day and this someone who never liked salads. Jocelyne, wow it’s great that it turned your son onto salad! Your pic is NOT dandelion! Dandelions are EXTREMELY bitter, endives don’t compare. Scale 1/10, dandelions are a 20, endives -5. The only way to eat is raw! Cooking destroys the nutrients, negates all liver detox benefits. Why bother to eat them if you’re gonna cook them!? Just go to McDonald’s, might as well. Me, I’ll eat my ORGANIC dandelions like a real man.